The Garden Plot: They're multiplying. And some are airborne! They're multiplying. And some are airborne! Recently I've been able to get some solid on-the-spot "recon" from my friend and colleague on her battle against stink bugs. 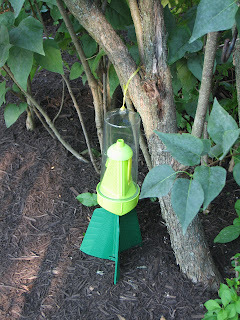 Her fence trap, wh ich gets full sun, began catching stink bugs within 2 days. She just put in the RESCUE! 7-week attractant and hung it in the same place. The one under the deck saw little action so she moved it to a sunny location, a lilac tree, with the trap fins touching branches and leaves. Voila! Stink Bugs are coming in but they ain't leaving the trap. Stuck inside to dehydrate and DIE. Now, yesterday, Peggy was visiting her friend, Sheila (who has a gigantic garden) and they were checking out her plants and veggies. "Don't see any bugs," said Sheila. " Peggy arched her all-knowing brow and remarked, "Just wait... let's check the leaves." 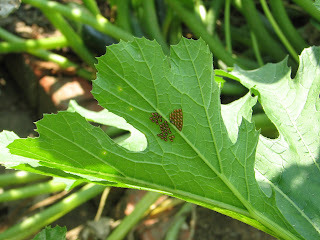 Sure enough... guess what was lurking, attached to the squash leaves in clusters of sticky oval eggs along with newly hatched nymphs that look like creepy ticks with long antennae? Yep. Stink Bugs. 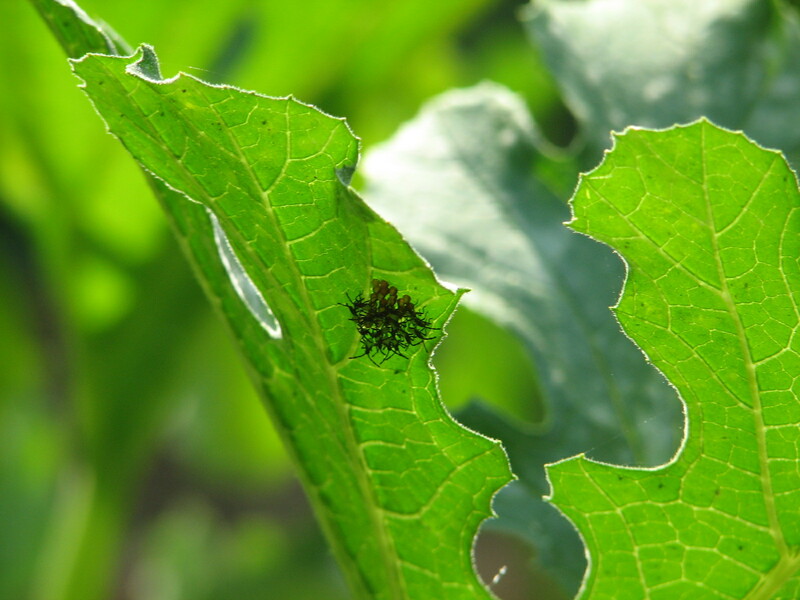 The nymphs can't yet fly, but are very fast movers with voracious appetites. They also saw a few fast moving "teenie boppers" that are about the size of pencil erasers, happily eating peppers, and more. And people, people... the nymphs become airborne within 50 days or less, and can move throughout your garden and landscape and decimate your veggies, fruit and berries and ornamentals. If the RESCUE! Stink Bug Trap is catching stink bugs, but seems to slow down, check for spiderwebs at the entrance, or replace the attractant with a refill if it's been exceptionally hot for weeks. 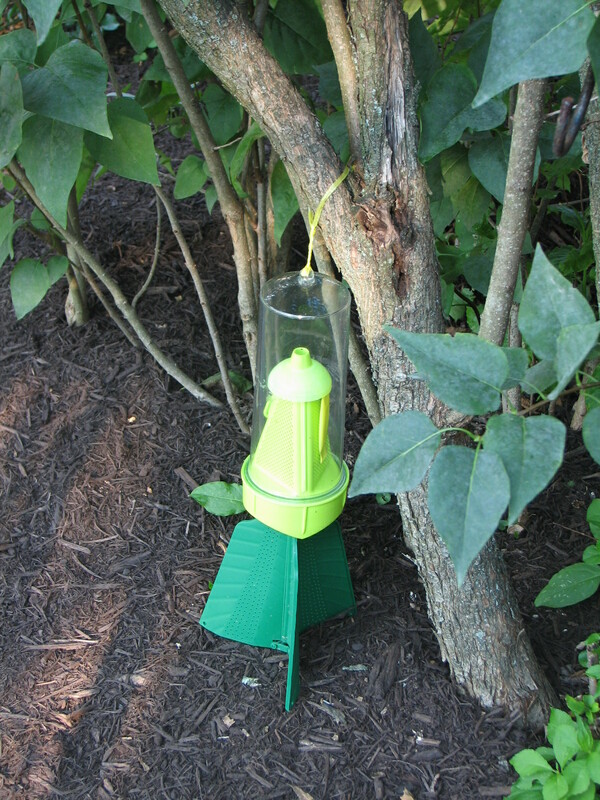 Buy at least 2 traps: One touching blades or leaves where the nymphs are congregated and one hanging on a post or tree where the adults will be lured. If you use mulch, check for adults: they hang out and are practically invisible. Place a trap nearby. If the trap seems to be attracting fewer numbers, move it. Check frequently. Recognize the enemy. Study Peggy's photos of the eggs and nymphs. Adult Stink Bugs have a shield-like appearance. Break the cycle. Reduce the population in your little piece of heaven with the only trap that's been scientifically designed and tested to work. 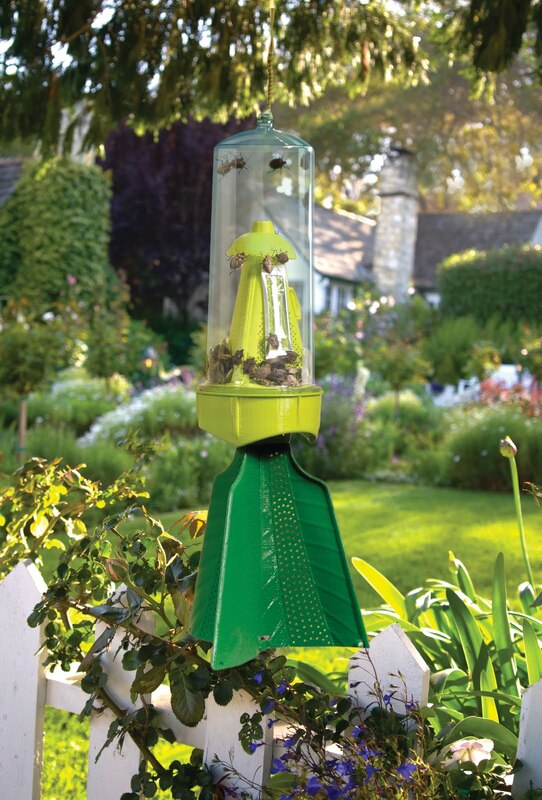 Trap and kill these stinkers before they switch gears in Sept/Oct and look for ways to get inside your home and overwinter, congregating in your attic - or crawl spaces- or dark, warm spots, waiting 'till spring arrives to buzz and dive-bomb us all once again. If we all get involved, we may just stop this menace. Let us know how your battle is going! We're here to help. Uggghhh!!! It's time to declare a stinkin' war against stink bugs. This is disgusting. But think of when these terrorists invade our homes in the fall.